Experimentation... - The BBQ BRETHREN FORUMS. Big Butz BBQ Sauce & Seasonings If our BBQ Sauces and Seasonings aren't winning awards then the things people create using them are. But, who cares about the awards! In the end it's keeping family and friends happy that matters the most. 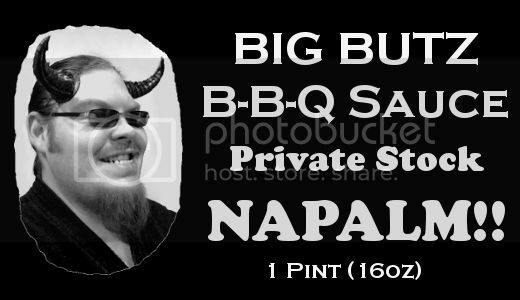 This is a great place to find out about our products, specials going on, and a support group for everyone relishing in a Big Butz BBQ Sauce addiction. I have to admit, keeping up with a line of 5 sauces and 4 rubs keeps me plenty busy. But, that doesn't stop my creative mind from always wanting to do more. Unfortunately, I won't be looking at mass producing any of these experiments (at this point in time). However, this doesn't mean that getting a hold of some of these is entirely impossible. One of the first things I've experimented with lately is a super low carb sauce using stevia as the main sweetener. There was a horrific accident that caused me to lose half of the batch and I'm down to only 6 jars. I'll be up front though, there were two things I didn't take into account when formulating this sauce. 1 sweeteners are really strong. 2 the flavor profile changes as this sauce sits longer. In the end, to me, it is just some really good ketchup with a hint of smoke flavor to it. All and all, not bad but, I wouldn't call it exactly a BBQ Sauce. However, the numbers on it are excellent in 2 Tbs it contains 3 grams of sugar, 4.25 total carbs, and about 280mg of sodium. The other experiment that is being conducted is to amp up my No Butz BBQ Sauce. As the world turns, hotter peppers are found and developed all of the time. I'm going to be playing with some Reaper Peppers. At this point I don't know what to expect but, I'm already figuring that there will only be about 24 jars available. I'm thinking about calling it No Butz Black Label. I did get my newest batch of private reserve sauce mixed up with the Reaper Peppers. After initial testing I'm contemplating calling it Napalm. Unlike our No Butz, this stuff likes to hang around and see if it can contort you into submission. It's got a great flavor to it though. One of the test subjects commented that it tasted so good but the burn was like a religious experience and he thought he actually saw God for a moment. Test results don't get much better than that. How do you get into this secret club? "earthbound but aspiring.... A lumbering soul but trying to fly...(with)...not enough wingspread but plenty of intention." I too would like to know how to get a hold of some of this sauce ! Tom, how much is a jar of Black Label going to run? I'd like to have a jar! There isn't a special club... yet. But, only friends and Brethren have been given the option to buy so far. So to me, you're all already in a special club. Hey Tom, is Rob getting a bottle? I want to try it (dunno why) but if he is getting a bottle, I will try his. If not, I will but him a bottle if you can bill me and send to him. In fact, I like that idea, no warning. Don't think he even knows about it yet. 16 left. I had some with some sliced smoked pork roast today and my brain felt hot. Not sure if that's normal but, it was kind of fun. I'm getting excited. Hmm what to do what to do. Shipping out the jars to the first victims tomorrow. They'll feature this stylish label and everyone comes signed. Looks like some of the Brethren have got their chance to start playing with Napalm. Only 8 jars left and don't know when another batch would be made.